It’s always interesting and fun to compare visual display technologies. People get so excited and heated about the topic. Eventually most enthusiasts end up putting their hard earned dollars on one side of battle, thus fueling the enduring debate. OLED (organic light emitting diode) is the newest technology in the lively TV/display market and my opinion is that it will be a viable alternative to LCD (liquid crystal display) TVs in the future. So which is better, LCD or OLED TV? OLED TV color information is produced using organic carbon-based compounds, which emit red, green and blue lights in response to electric current. OLED differs most from LCD in that there is no backlight and no “twisting” crystals. There is no additional light source needed to energize the organic color compounds, therefore they use considerably less power and can be manufactured with an extremely thin profile. OLED TV panels come with either two or three layers of the organic compounds which are located in one super thin layer of the “glass”. The panel is supported by a hard plexiglass material which also protects the sensitive inner materials. Remember CRT (cathode ray tube) TVs? OLED displays use a cathode layer to introduce electrons to the first layer of organic molecules. Whether spread across a flat-panel screen or placed in the heart of a projector, all LCD displays come from the same technological background. A matrix of thin-film transistors (TFTs) supplies voltage to liquid-crystal-filled cells sandwiched between two sheets of glass. When hit with an electrical charge, the crystals untwist to an exact degree to filter white light generated by a lamp behind the screen (for flat-panel TVs) or one projecting through a small LCD chip (for projection TVs). LCD TVs reproduce colors through a process of subtraction: They block out particular color wavelengths from the spectrum of white light until they're left with just the right color. And, it's the intensity of light permitted to pass through this liquid-crystal matrix that enables LCD televisions to display images chock-full of colors-or gradations of them. 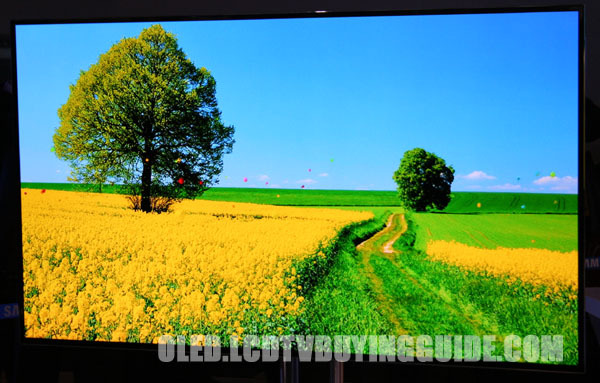 LED TVs are a different form of LCD TV and are sometimes confused with OLED TVs. OLED televisions excel in black levels and contrast, far exceeding LCD. The stated contrast ratio for the new Sony OLED TV is 1,000,000:1 compared with the highest stated contrast for an LCD of 10,000:1. While both of these contrast figures are unrealistic for actual calibrated TV viewing, they are an indicator of just how superior OLED is in this category. Since there is no backlighting required for OLED TVs, it is easy to obtain deep black levels by limiting conductivity to the emissive organic compounds. This allows for deep rich black levels. Just as plasma technology the OLED display will use less power as less light is needed. White and bright colors will require the most power, thus to produce bright whites more current will flow through to the emissive organic compounds. LCD (liquid crystal diode) displays, by contrast, utilize electric charges to twist and untwist liquid crystals, which causes them to block light and, hence, emit blacks. The higher the voltage passing through the liquid crystals in a given pixel, the more fully those crystals untwist and effectively block light - all of which makes these pixels darker. As opposed to plasma, LCD TVs use the most power when displaying a very dark or black image. This is a difficult process, and despite recent improvements in LCD black levels, only the best LCD televisions (like those produced by Sharp and Sony) have managed to topple the 1000:1 contrast ratio barrier. Recent improvements have brought LCD displays up to the level of plasma. The one continual drawback here for LCD is off axis viewing, when black levels consistently drop. ADVANTAGE: OLED TV is clearly superior in this category. LCD TV manufacturers have made great improvements in black levels and in many cases have managed to match the contrast ratio of plasma displays. However, often even when black levels seem excellent on LCDs the dark matter detail suffers. We do not anticipate this problem with OLED, but it still remains to be seen. In OLED displays, each pixel contains red, green, and blue elements, which work in conjunction to create the millions of colors. Insofar as each pixel contains all the elements needed to produce every color in the spectrum, color information is more accurately reproduced with OLED technology than it is with LCD. We anticipate that the chromaticity coordinates will be more accurate with OLED than with LCD. From the OLED TVs that we have seen, color information is rich, deep and more realistic than LCD TV. LCD TVs reproduce colors by manipulating light waves and subtracting colors from white light. This is an inherently difficult template for maintaining color accuracy and vibrancy - though most LCD displays manage quite well. While color information benefits from the higher-than-average number of pixels per square inch found in LCD televisions, LCDs are simply not as impressive in color realism and tracking due to the difficult and somewhat manufactured process that they undergo to create color information. ADVANTAGE: OLED TV. Color will be richer and more realistic, generated by organic phosphors using active matrix technology. OLED TV screens have near perfect viewing angle. OLEDs create light (are emissive) rather than block light. Every pixel is lit independently and that light will be seen from off axis viewing angles easily and accurately, much the same as plasma. As a result, expect perfect viewing angles of 170 degrees. LCD TV manufacturers have done much to improve their displays' viewing angles, but this is an area of constant struggle. LCD TVs must block light to create darker images, thus contrast suffers at angles significantly. The substrate material on newer-generation LCD models by Sharp and Sony has helped to expand those units' viewing angles. Sony is introducing the first OLED screens to be sold in the U.S. This display is 11” and will be sold primarily as a computer monitor, though it does have HDMI input. Resolution on this first Sony OLED TV XEL-1 is 960 X 540. Computer graphics work demands more resolution and as a result this may hurt sales of this first offering. Alternatively, Samsung claims to make a 17” AMOLED that is a good bit thicker but contains 1600 X 1200 (UXGA resolution). This resolution puts OLED squarely in LCDs space for computer use. LCD monitors display images from computer or VGA sources extremely well, with full color detail, no flicker, and no screen burn-in. Moreover, the number of pixels per square inch on an LCD display is typically higher than other technologies, so LCD monitors are especially good at displaying large amounts of data – graphics applications for example and with exceptional clarity and precision. For the same reasons, LCD TVs is also a slightly better template for video gaming. Since LCDs functioning as computer screens are being viewed from straight on, viewing angle and contrast problems are minimized. ADVANTAGE: LCD at this point. 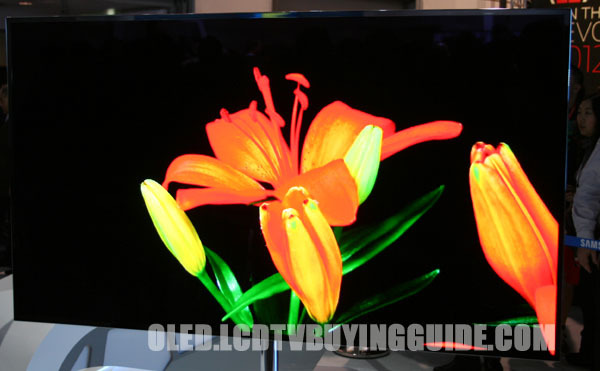 OLED TV does not suffer from motion lag or motion blur as does LCD displays. In fact, OLED technology has the fastest response rate time of any type of display due to utilizing TFT technology with the organic light emitting diodes. While the "response time" of LCD TVs has markedly improved in the last couple of years, they still suffer from a slight "trailer" effect, where the individual pixels are just slightly out of step with the image on the screen. This can also be described as dithering noise, or a jumpiness in the picture image when a scene is filmed with a moving camera. During fast moving sports scenes, the most discerning eyes can detect this slight motion response lag. ADVANTAGE: OLED TV is fantastic in this area. Altitude has no impact on either OLED or LCD technology displays. LCD television manufacturers claim that their displays last, on average, 50,000 to 65,000 hours. In fact, an LCD TV will last as long as its backlight does - and those bulbs can sometimes be replaced! Since this is nothing more than light passing through a prismatic substrate, there is essentially nothing to wear out in an LCD monitor except the bulb and some of the component boards. However, one nasty little known fact about LCD technology is that as the backlight ages it can change colors slightly (think of florescent office lighting). When this occurs the white balance of the entire LCD TV will be thrown off and the user will need to re-calibrate, or worse, try to replace the backlighting or ditch the unit altogether. Some of the early purchasers of larger LCD screens will be learning this tidbit in a couple of years. I expect that LCD televisions will actually give a user around 30k to 40k hours before the backlighting begins to go. One thing that I've found in this industry, it is not easy to find out whether the backlighting on LCDs can be replaced. Manufacturers are either hesitant to discuss the topic, or they just don't know. OLED televisions on the other hand utilize slight electric currents to excite a combination of of organic phosphorescence encased in a plastic substrate. OLED needs very little power to operate so in theory should last for a very long time as the parts are not taxed significantly. Here’s the catch, the blue organic phosphor LED has a short life (a guess is 7,000 hours). The red and green material may not last much longer. Those first OLED displays will be an experiment with regard to longevity. ADVANTAGE: LCD a clear winner at this point. Since OLED TV is made from organic LED material there may be burn in issues, though we do not anticipate them being as bad as the first plasma displays. LCD displays do not have burn in issues. The backlight passes through “twisting” crystals which are a hard material not subject to etching. ADVANTAGE: LCD though we will see how OLED performs in this area. The new Sony OLED XEL-1 television is 11” and $2499. One of the big questions surrounding OLED TVs is whether or not Sony and Samsung can produce them in quantity, at the larger sizes, and price competitive. Given the strength of LCD, this will be a challenge. Creating a blue LED that lives a long life may be one of the keys. As a flexible technology, requiring plastics rather than glass as plasma does, this may be the most adaptive display technology we have seen. Prices will only come down as production rises. In the past the substrate material for LCD TVs was difficult to produce in large sizes without pixel defects owing to faulty transistors. These problems have been overcome and this technology is easier to produce in quantity and in volume. There are no soft parts to incorporate such as living phosphors. LCDs get larger and prices continue to decline. An 15” LCD screen with a resolution of 1024 X768 costs approximately $180. Because LCDs use florescent backlighting to produce images, they require substantially less power to operate than plasmas do. 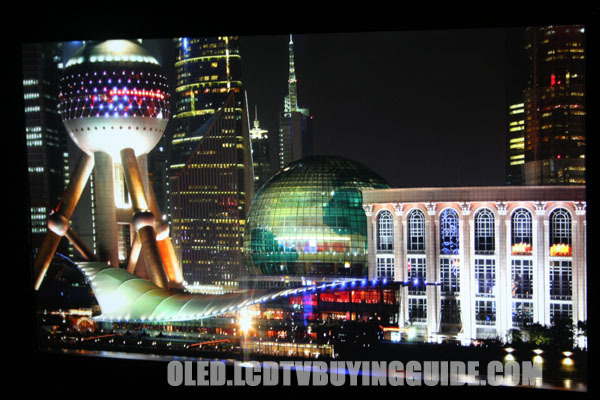 However, OLED TVs require only a fraction of that amount due to the absence of a lighting source. OLED displays are the lowest power consumption displays in the world.